If you’re a New Yorker or have ever visited the city during the warmer months, you’re probably familiar with the abundance of food festivals scattered throughout the five boroughs. Some food festivals are better than others, though, and Williamsburg's Smorgasburg Food Flea Market is the cream of the crop. Located in Brooklyn on Kent Avenue and N. 7th Street, Smorgasburg offers a wide range of new food items to try, with every bizarre food combination your taste buds could possibly imagine. The best part about Smorgasburg is walking around and coming to the realization that you are salivating to try something you didn’t even know existed. 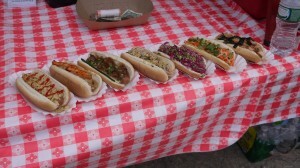 Take AsiaDog, for instance, a marriage of one of America’s most iconic meals, the hot dog, and Asian fusion flavors. In this dish, Chinese, Japanese, Thai, and Korean menu items are paired with a staple of New York street food. Who knew such a thing could even work as one dish? 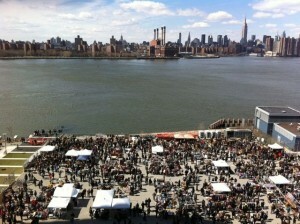 The list of wild concoctions you’ll discover at Smorgasburg doesn't stop there. Takumi Taco is your spot if you’re in the mood to try Japanese tacos. And the appropriately named Dough is a fantastic doughnut stand, sure to satisfy your sweet tooth. (Though fair warning: they are seriously enormous.) If you’re looking for a creative take on the slider, head on over to Bossa Nova Chicken Burgers. Or, for one of the craziest food items you'll ever find, try the Ramen Burger: you can check out our video about it here. Every food vendor represented is from a shop located somewhere within New York City, so when you find your new favorite thing to nosh on, you'll be able to experience it again and again. Once you’ve had your fill of food, take a moment to digest over at the beer garden located in the center of the flea market. Granted, the space itself is a bit on the small side, but it serves it’s purpose, especially when the weather is nice. Unfortunately you can't walk around with an alcoholic beverage, so it’s best to save that for the end -- assuming you still have room in your stomach, that is. 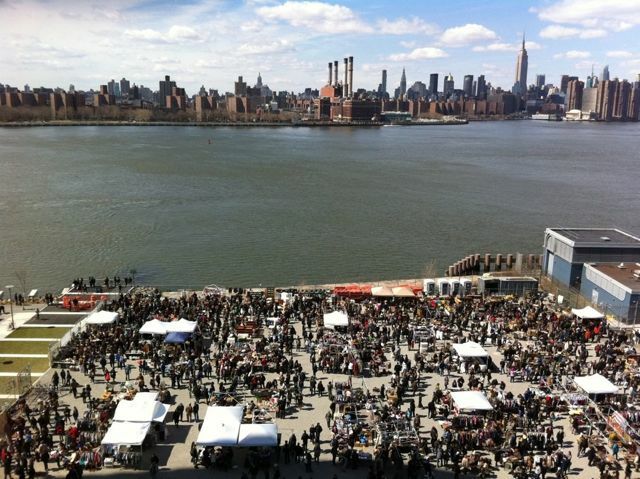 Smorgasburg happens in two locations every weekend: Saturdays at East River State Park—Kent Ave. and N. 7 St.—on the Williamsburg waterfront; and Sundays in Prospect Park. Both locations are open from 11am to 6pm, and feature packaged and prepared foods, beverages, and more from purveyors from New York City and across the region, for a total of 75-100 vendors. The markets are always open rain or shine. Here's our host Robb Coles at the event in Wiliamsburg. It features the companies: Ish Horseradish, Brooklyn Sodaworks, Table Swoon, Smore Bakery, Luca and Bosco Icecrean and Ramen Burger!